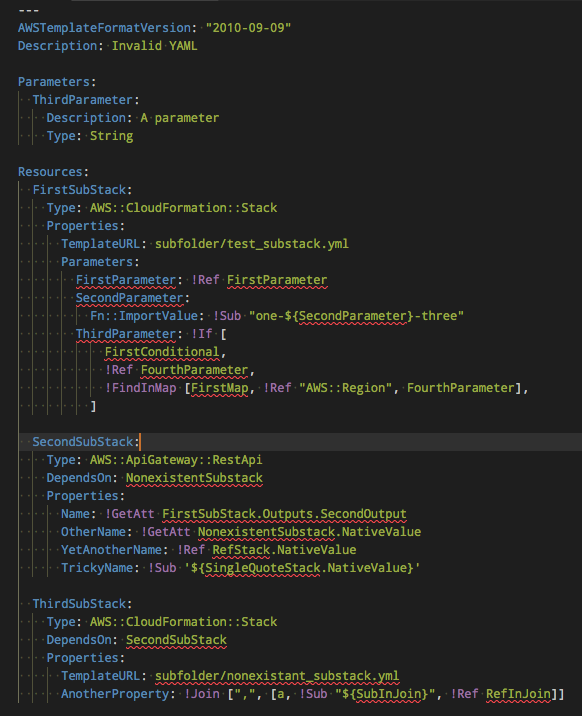 Visual Studio Code>Programming Languages>cloudformation-yaml-validatorNew to Visual Studio Code? Get it now. This extension focuses on reference errors in Cloudformation YAML files and their sub-stack resources. It is best used together with a linting plugin like vscode-cfn-lint, which can warn you about errors specific to AWS resources. The extension should be triggered automatically when loading YAML or YML files and it should avoid parsing non-cloudformation YAML files. To run it manually, open the command pallet and select "Cloud Formation YAML Validator: Validate YAML"
To recursively search in sub stacks, open the command pallet and select "Cloud Formation YAML Validator: Validate YAML, recurse into sub stacks"
Please log more if you find any.